Detroit, MI – Thom Connors, SMG regional vice president and general manager of Cobo Center, announced today that the riverfront atrium that was temporarily put into service for the 2013 North American International Auto Show (NAIAS) is now closed for final construction and will open again this summer with the 40,000 square foot Grand Ballroom and surrounding state-of-the-art facilities. 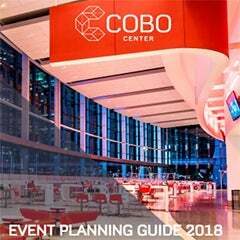 “International press, visitors and local attendees were all energized by the glimpse of how the final Cobo Center renovations will add beauty and functionality to events in the center. 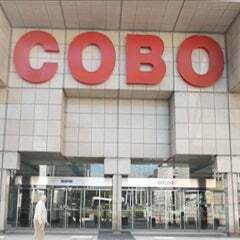 Everyone was up-beat and primed for the show with this first peak at just how much of an impact the Cobo transformation will have,” said Connors. “Visitors to the North American International Auto Show will likely be as impressed with the redesigned Cobo Center as they will be with the redesigned automobiles. 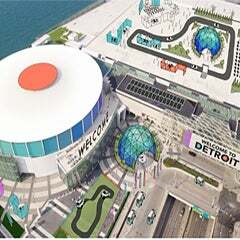 … Visitors will see the new atrium, with its Tara-like staircase that opens up to a wall of windows giving a beautiful view of the Detroit River and the Windsor skyline,” Nolan Finley, editorial page editor for The Detroit News wrote mid-show. Once unveiled for the NAIAS, the Cobo atrium hosted opening ceremonies and several high profile events such as the North American Car & Truck of the Year Award announcements. The Detroit Auto Dealers Association also hosted a concert by Uncle Kracker on Charity Preview night. In 2011, the NAIAS signed a five-year contract with SMG to keep the show in Cobo Center through 2017. This year’s show, running from January 14-27, had a total attendance of 795,416, its best attendance in eight years.